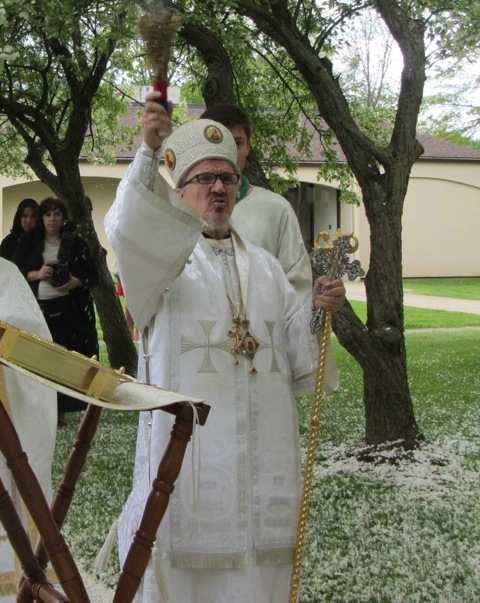 Hermitage, PA - The St. George Serbian Orthodox Church in Hermitage, Pennsylvania celebrated their Church Slava on second Sunday of Pascha, May 12, 2013, the Sunday of Thomas. His Grace Bishop Mitrophan of Eastern America offiiciated at the Divine Liturgy assisted by local clergy, V. Rev. Milovan Katanic. Joining the liturgical celebration was Fr. David Mastroberte of the neighboring St. John's Carpatho-Russian Church who, with the blessing's of the bishop, took part in the festive Slava Litiya. His Grace, the bishop, served the Cutting of the Slava Kolach in the church hall following the liturgy with this year's Slava kumovi Bozo and Sava Grkinic.